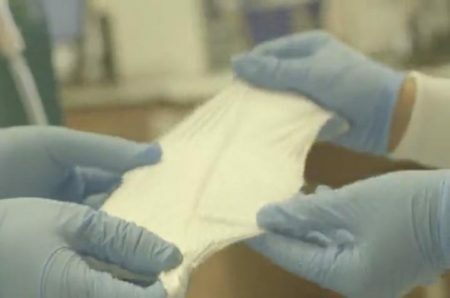 Drexel University researchers are making a fabric-like electrode material that could help make batteries and supercapacitors safer, better and less expensive. The new material also offers more operating speed while reducing the potential for leaks or disastrous meltdowns. Their design for a new supercapacitor, which looks something like a furry sponge infused with gelatin, offers a unique alternative to the flammable electrolyte solution that is a common component in these devices. Drexel researchers have developed a solid-state, free-standing electrode that can make energy storage devices safer by eliminating their flammable electrolyte solution. The electrode uses a carbon fiber mat, made by the process of electrospinning shown here. Image Credit: Drexel University. Click image for the largest view. The electrolyte fluid currently inside both batteries and supercapacitors can be corrosive or toxic and is almost always flammable. To keep up with our advancing mobile technology, energy storage devices have been subject to material shrinking in the design process, which has left them vulnerable to short circuiting, as in recent cases with Samsung’s Galaxy Note devices, which, when compounded with the presence of a flammable electrolyte liquid, can create an explosive situation. So instead of a flammable electrolyte solution, the device designed by Vibha Kalra, PhD, a professor in Drexel’s College of Engineering, and her team, used a thick ion-rich gel electrolyte absorbed in a freestanding mat of porous carbon nanofibers to produce a liquid-free device. The group, which included Kalra’s doctoral assistant Sila Simotwo and Temple researchers Stephanie L.Wunder, PhD, and Parameswara Chinnam, PhD, recently published its new design for a “solvent-free solid-state supercapacitor” in the American Chemical Society journal Applied Materials and Interfaces. Supercapacitors are another type of energy storage device. They’re similar to batteries, in that they electrostatically hold and release energy, but in our technology – mobile devices, laptops, electric cars – they tend to serve as a power backup because they can disburse their stored energy in a quick spurt, unlike batteries that do so over long period of use. But, like batteries, supercapacitors use a flammable electrolyte solution, as a result they’re vulnerable to leakage and fires. Not only is the group’s supercapacitor solvent-free, which means it does not contain flammable liquid, but the compact design is also more durable and its energy storage capacity and charge-discharge lifespan are better than comparable devices currently being used. It is also able to operate at temperatures as high as 300º Celsius, which means it would make mobile devices much more durable and less likely to become a fire hazard due to abuse. The key to producing this durable device is a fiber-like electrode framework that the team created using a process called electrospinning. The process deposits a carbon precursor polymer solution in the form of a fibrous mat by extruding it through a rotating electric field – a process that, at the microscopic level, looks something like making cotton candy. The ionogel is then absorbed in the carbon fiber mat to create a complete electrode-electrolyte network. Its excellent performance characteristics are also tied to this unique way of combining electrode and electrolyte solutions. This is because they are making contact over a larger surface area. If you think of an energy storage device as a bowl of corn flakes, then the place where energy storage happens is roughly where the flakes meet the milk – scientists call this the “electrical double layer.” It’s where the conductive electrode that stores electricity meets the electrolyte solution that is carrying the electric charge. Ideally, in your cereal bowl, the milk would make its way through all the flakes to get just the right coating on each – not too crunchy and not too soggy. But sometimes the cereal gets piled up and the milk – or the electrolyte solution, in the case of our comparison – doesn’t make it all the way through, so the flakes on top are dry, while the flakes on the bottom are saturated. This isn’t a good bowl of cereal, and its electrochemical equivalent – an electron traffic jam en route to activation sites in the electrode – is not ideal for energy storage. Kalra’s solid-state supercapacitor is like putting shredded wheat in the bowl, instead of cornflakes. The open architecture lets the milk permeate and coat the cereal, much like the ionogel permeates the carbon fiber mat in Kalra’s solid-state supercapacitor. The mat provides a greater surface area for ions from the ionogel to access the electrode, which increases the capacity and improves the performance of the energy storage device. It also eliminates the need for many of the scaffolding materials that are essential parts of forming the physical electrode, but don’t play a role in the energy storage process and contribute a good bit to the device’s overall weight. The next step for Kalra’s group will be applying this technique to the production of solid-state batteries as well as exploring its application for smart fabrics. This team is offering something very attractive to the industry. Reduced operating risks with potential for reduced costs plus faster operation looks like a winner. Plus, they have some explaining skills, those paragraphs above using cereals as examples are creative, informative and accurate that can inform even the utter novice to grasp what this is about. So double congratulations for these folks! This is a very meaningful study. This topic deserves more people’s attention. At the same time, we also have the obligation to pay attention to such topics. Thank you very much. It is a good studying experience! Thanks for your sharing. more and more technology will be used in industry! Thanks for sharing useful post!